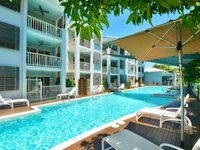 Property 27: Have a 'Beach Break' at the best beach in Cairns! Property 40: Oasis Resort - 2 Bedroom 2 Bathroom Apartment!! Property 44: Seascape One - located in the heart of Palm Beach. Great family location! This was a cozy and warm place to relax after long days out exploring the county.